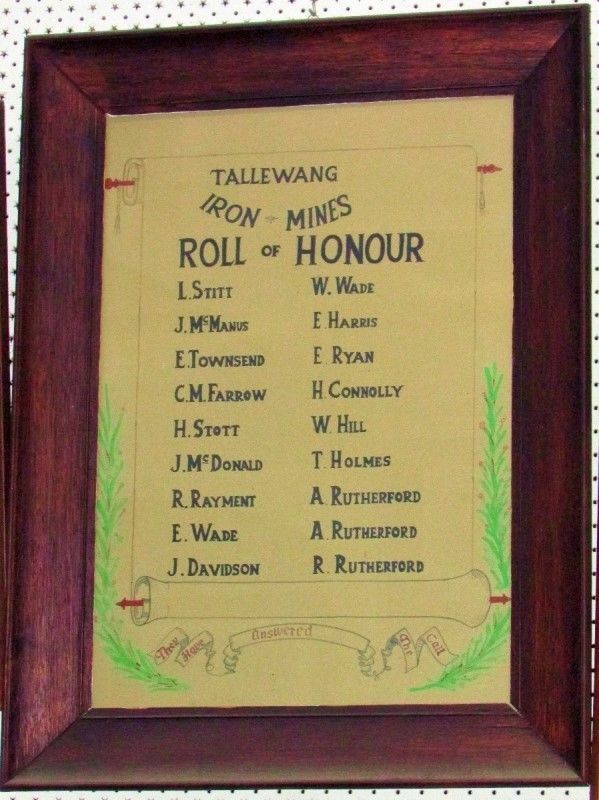 A framed paper honour roll commemorates those from the Tallewang Iron Mines who enlisted in World War One. Note: Monument Australia believes this roll may be a copy of the original roll which was unveiled in September 1916. At the Tallewang iron mines, last week, a roll of honor was unveiled. The honor board contained the names of the men who had enlisted from that quarter. An excellent supper was provided by the men. The manager Mr G. Barrow invited Mr. A. Baldwin to unveil the memorial. Mr. Baldwin said that though he would be very pleased to perform the ceremony he thought it would be a compliment to ask Mrs. Rutherford, whose three sons were at the front, to unveil the Roll of Honor. (Applause). The Roll of Honor was unveiled amidst applause by Mrs. Rutherford. The names on the Roll appeared in the following order: — L. Still, J. McManus, E. Townsend, G. M. Farrow, H. Stott, J. McDonald, R. Rayment, E. Wade, J. Davidson, W. Wade, E. Harris, E. Ryan, H, Connelly, W. Hill, T. Holmes, A. Rutherford, Arthur Rutherford, — Rutherford.